This is not an April Fool’s joke…I’m going to try and get back to blogging. 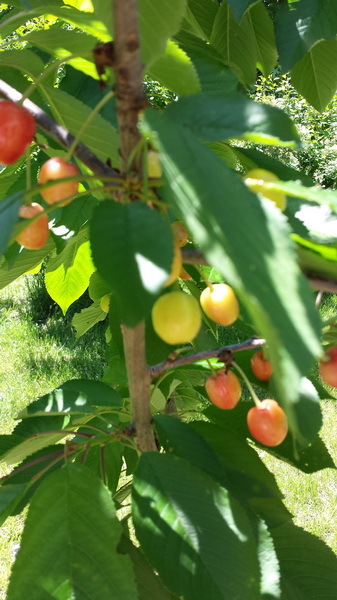 It was last July that I posted my last blog and I have no reason why I stopped blogging. I can tell you that this is not as easy for me as it seems for others, I struggle with every post. I mentioned this at a stitch-in last week and said I was having difficulty getting back to blogging and that it was not easy for me to write. Someone said they enjoyed the blog and I needed to do it again. So here I am. I do have lots to share with you. So since I last blogged I have had both my knees replaced and so I can go-go-go. One knee was a year ago, March 2016 and the other just last January 2017. Good thing they were replaced in the order they were…first knee was much easier than second… But I am on the road to recovery and am getting around. I took a crochet class last year. I knew how to crochet but was self-taught and figured I’d taught myself some bad habits. 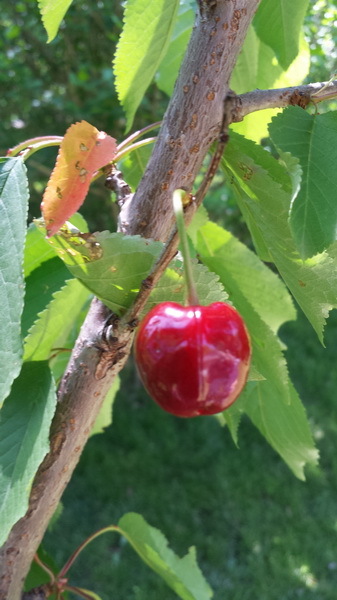 I found out other than the fact that I hate to ripe out and would rather adapt, I was doing it correctly. I learned when I was young (21 years old) and must have followed the written instructions pretty well. I should have! I wrote all the instructions for that baby blanket out in long hand before stitching. 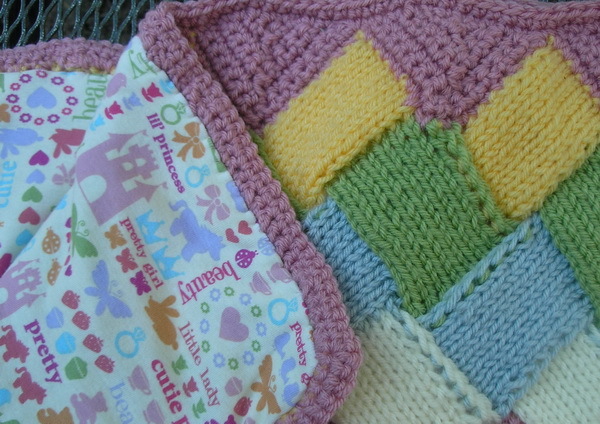 I remember because my best friend was expecting her daughter and I wanted to make her a special baby blanket. I knew I wanted it to be granny squares (only because I knew what the finished product should look like) and so I bought all this baby yarn (more than I needed) and thought I would have my grandmother teach me how to crochet. Grandma lived with us but she didn’t know how to crochet…my aunt did but she had just left for a month in Europe, so I decided to teach myself. 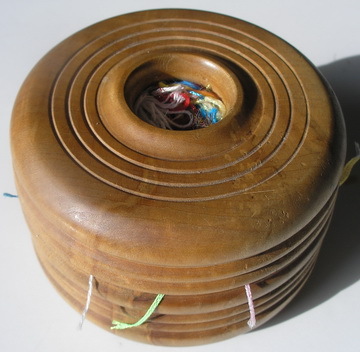 I was so intimidated by the instructions, they were written in code…5 sc , join with ss to make ring. Clusters: 3 sc, 4 dc in ring, 2 sc, * 3 dc in ring, repeat 3 times , ss to 3rd ss of 1st cluster. Tie off.. Oh my gosh, I wrote every instruction out in long hand for the whole blanket! Then I would stitch, take it out and re-stitch until it looked like the granny square afghan in our family room. I’ve come a long way, now I can read a pattern (not always correctly) and I can sometimes even crochet correctly, but I can make a finished product in a reasonable amount of time. This is the poncho I finished last fall…and yes I creatively adapted the instructions. And BTW, it looks better on me than on this hanger. This year I am going to try and learn to knit, I’ve tried before but not very successfully, so when my friend moves home this time for good from HongKong we are going to learn to knit among other things yet unknown. Life will be a bit calmer since my friend is not going back to Hong Kong and we can go at a slower pace. So, as we go along and I gather my thoughts and take a few pictures I will share with you some of the things I did last year as well as some of the things I am stitching now. And I know, one of these days I need to get back to finishing again, I still have bunches of stuff to finish and keep stitching more. 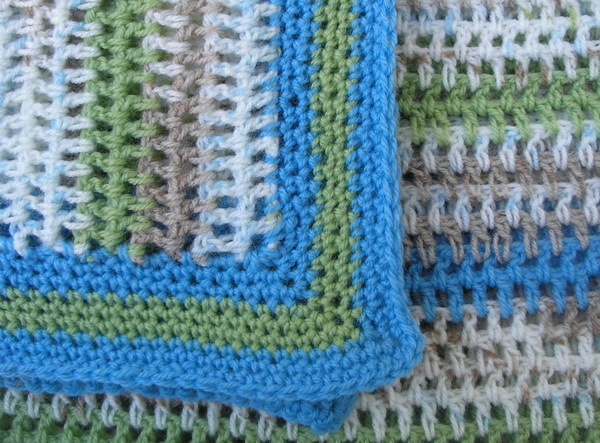 I started finishing with four huck towels that have been stitched more years than I have had grandchildren. I loved doing these with all the women in my family. I have a drawer full of them already finished and use them…because I can’t take them with me and I know none of my children or grandchildren will want them. I’m saving them from a garage sale or worse the thrift market. And if I get the right out of the dryer I can hand press on counter and they require no iron. I have more huck toweling and after get some of this finishing out of the way may try again. Wish I could find linen huck towels, they are my favorite and colored huck toweling would be wonderful too; but all I can find now is white and it soils so quickly. Anyway, I am starting my finishing with huck towels. First I pulled a thread at the bottom to make sure material was even…I would like to tell you this can instantly to me but truth is after I pined the first towel I realized the fabric was not even on the bottom…then it came back to me that I had seen my mother pull a thread (more about that later) and even the fabric up. 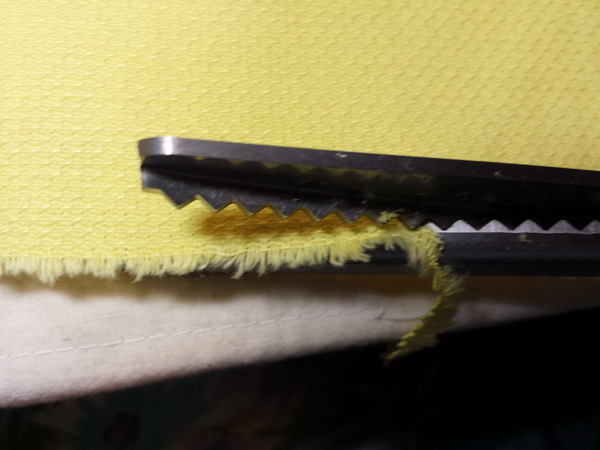 Then I cut on the pulled thread line with my pinking shears. 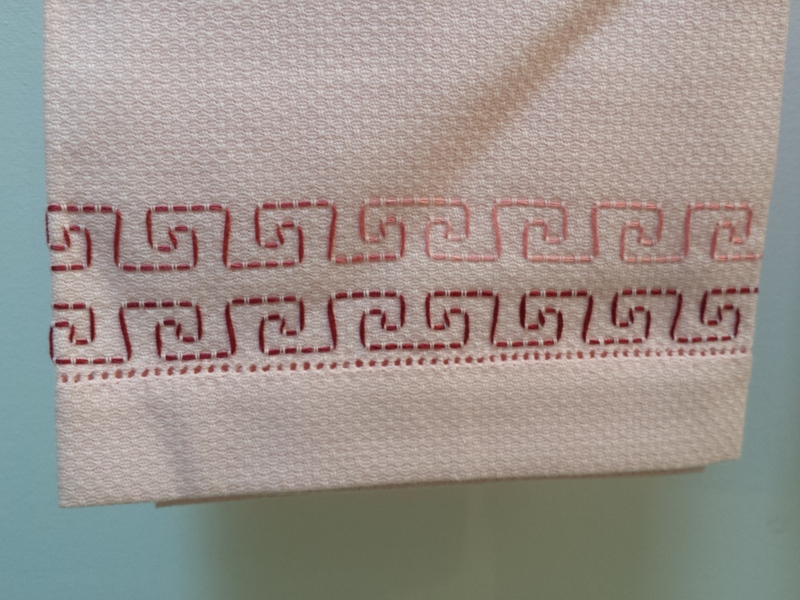 I used the floats (these are the parallel vertical threads on huck toweling you use to make the designs) to turn a small hem and then a hem about 1 inch. 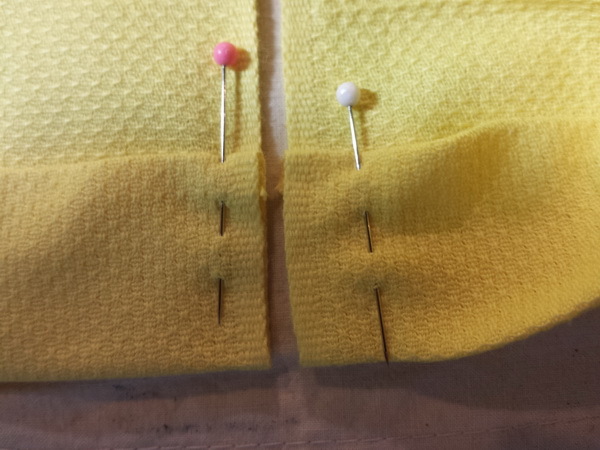 I pinned the hems and made sure I had not slipped a thread or two by matching the ends. 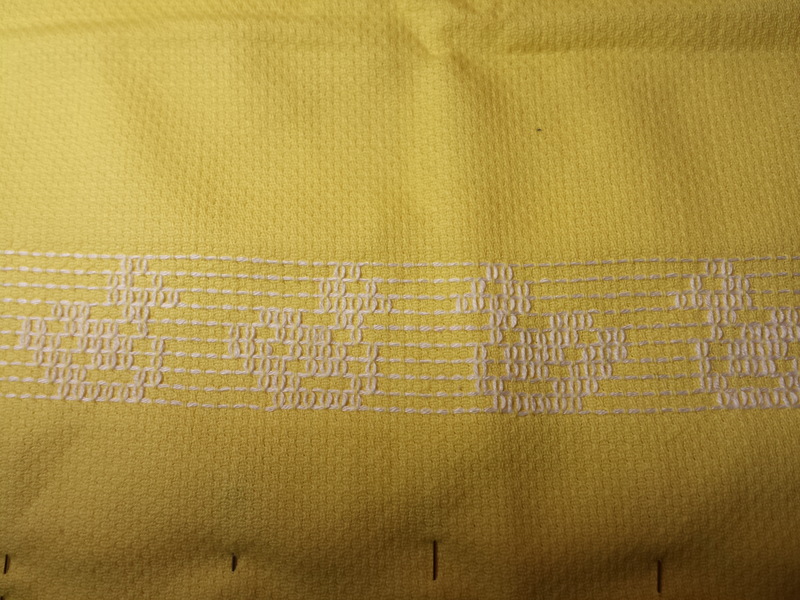 I always have to think about hemming…most of my needlepoint stitches are completed by stitching diagonally or from left to right and hemstitching is executed from right to left. It’s one of those out of order sequences for me. Here’s my diagrams that will go in my finishing notebook…the small stitches have been exaggerated, you really should not see the stitches. 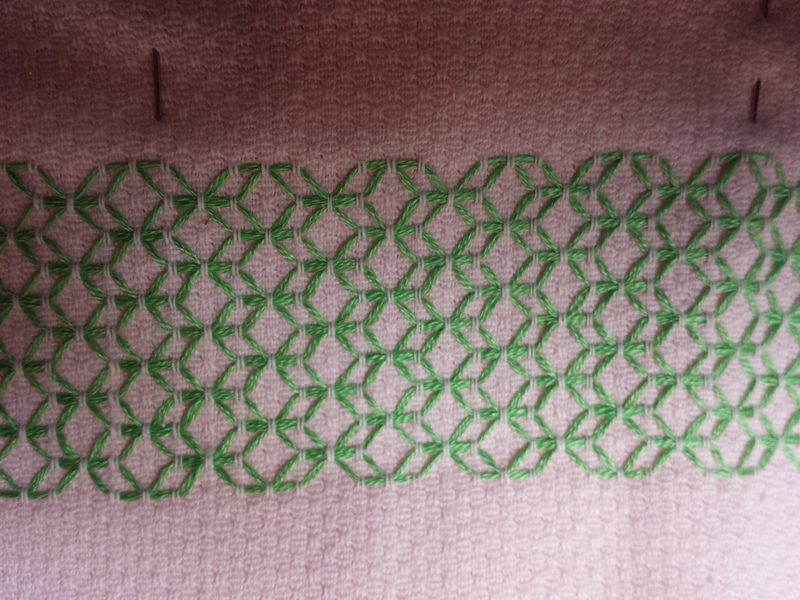 I just catch a few threads on the backside (top) and try never to go to the front of the fabric. (This is where those floats on huck toweling are good. 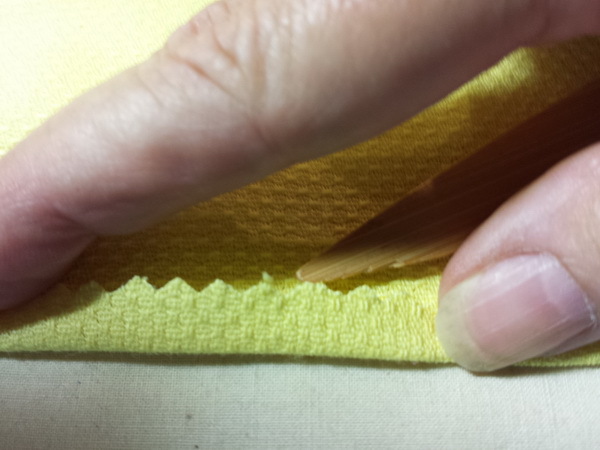 Slide the needle about 1/4 inch left and come out very close to the turn back(1/4 inch) in the pinned 1 inch hem. It was fun to stitch these towels and remember the wonderful women who stitched these and gave me my love of needlework . I never appreciated how detailed my mother was in her craft work. She was an office manager and very left brained in her life, so it should have been no surprise to me she would be this way in her crafts too. 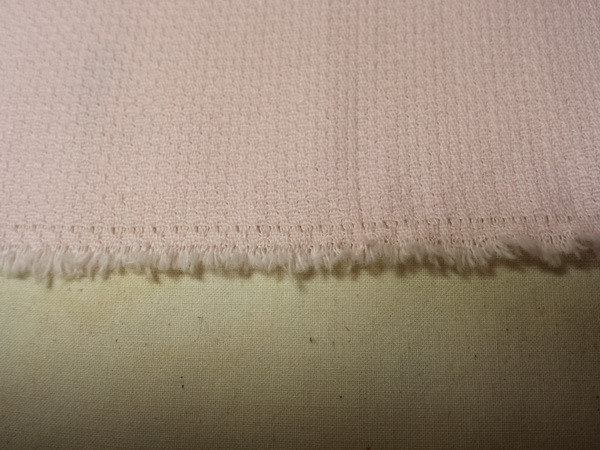 Notice this towel with the overdyed thread all the threads have been pre-cut to keep the color in the proper areas. But on the small band on the other end she either forgot or accidentally stitched with the wrong end of the thread in the needle. 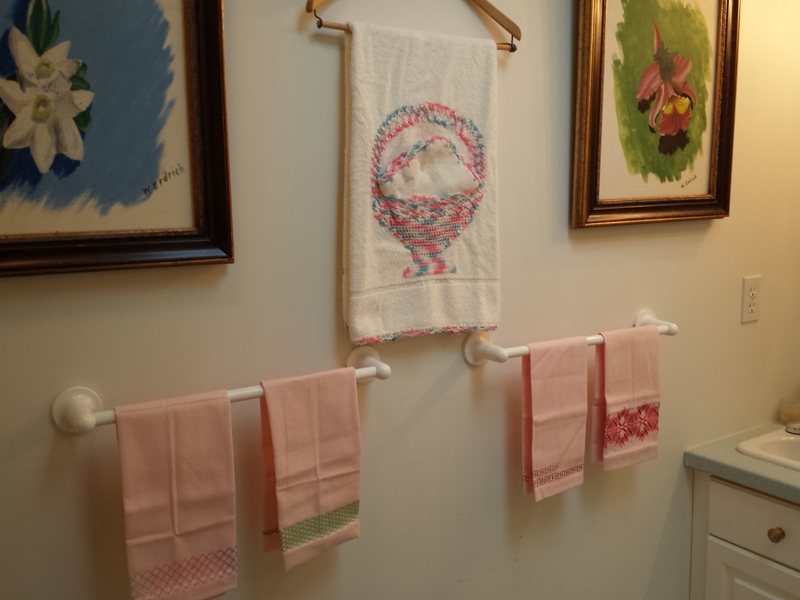 When I went to hang three of the towels (pink ones) in the office bathroom I found one my mother had finished and she open hem stitched it. 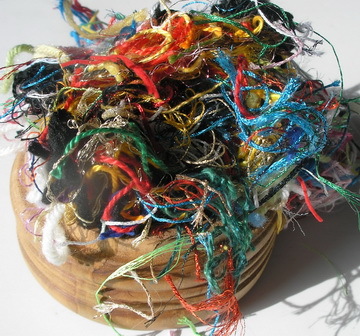 Remember I told you I remember her pulling a thread or two? 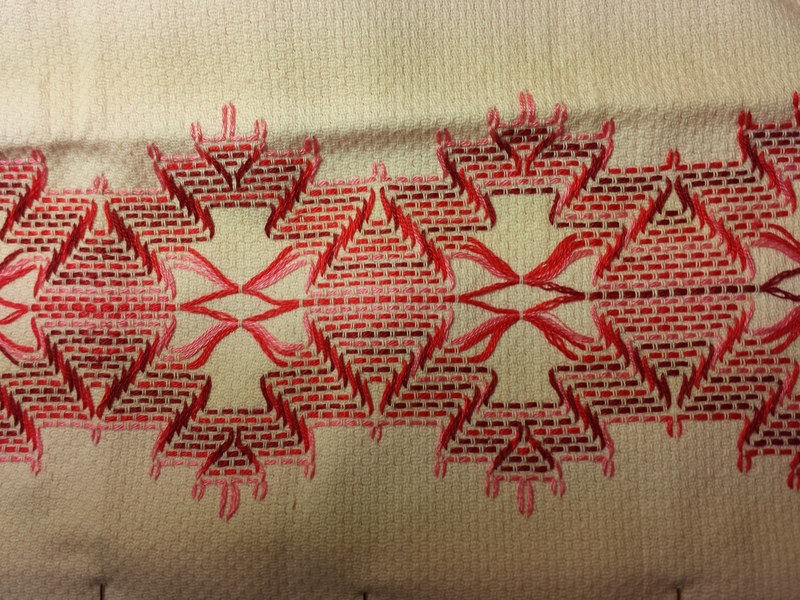 Well, maybe she was pulling threads to do an open hem stitch; but I think she pulled a thread to even the fabric too. I was lucky to get mine hemmed, open hem stitching will have to wait another day. But now they are stitched hanging in my office bathroom, I can see them from my desk. They will get little or no use (I keep Viva towels in there for everyday use.) The towel wall is mostly decorative and I figure I will enjoy them the most. The bath towel in the center hanging on the men’s suit hanger my great Aunt Rose made and it hangs on a wooden hanger from a men’s clothing store my mother managed for years. Aunt Rose crocheted around the hand towel and then crocheted the basket right onto the towel…needless to say it has never been used. It is a treasure. Isn’t it fun to look at things that were made when life was slower and simpler; it brings back such fond memories of those that shaped who I am today. The Granny Square Book by Margaret Hubert. I can’t knit one stitch but crochet is up my alley and Granny squares are a three generation favorite in my family. And January is yarn sale month at Joann’s and local knit shop so I think I see a Granny Square something in my future. As I looked through this book all I could think about was Carrie Hall who had wanted to make a quilt of each pattern available, but soon decided that was an impossible task and so settled on trying to making one of every quilt block she knew. This quilt block collection is part of Spencer Gallery of Art at KU (http://www.spencerart.ku.edu/ ) Lawrence Kansas and the subject of the book, The Romance of the Patchwork Quilt by Carrie A. Hall and Rose Kretsinger. The different granny squares remind me of those quilt blocks. Maybe I’ll make a quilt with different crocheted blocks. 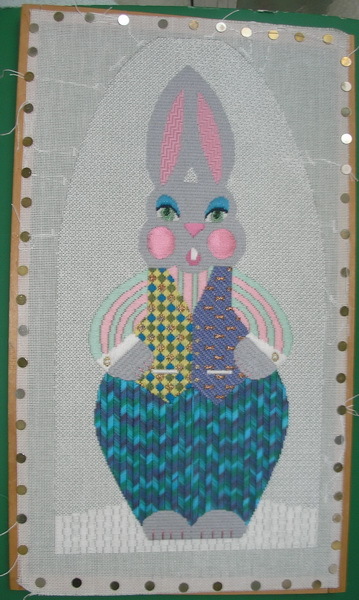 The next book is The Pattern Library Needlepoint, edited by Amy Carrol. I have a friend who has this book; I have always liked it and have had it on my want list even when it wasn’t always available. 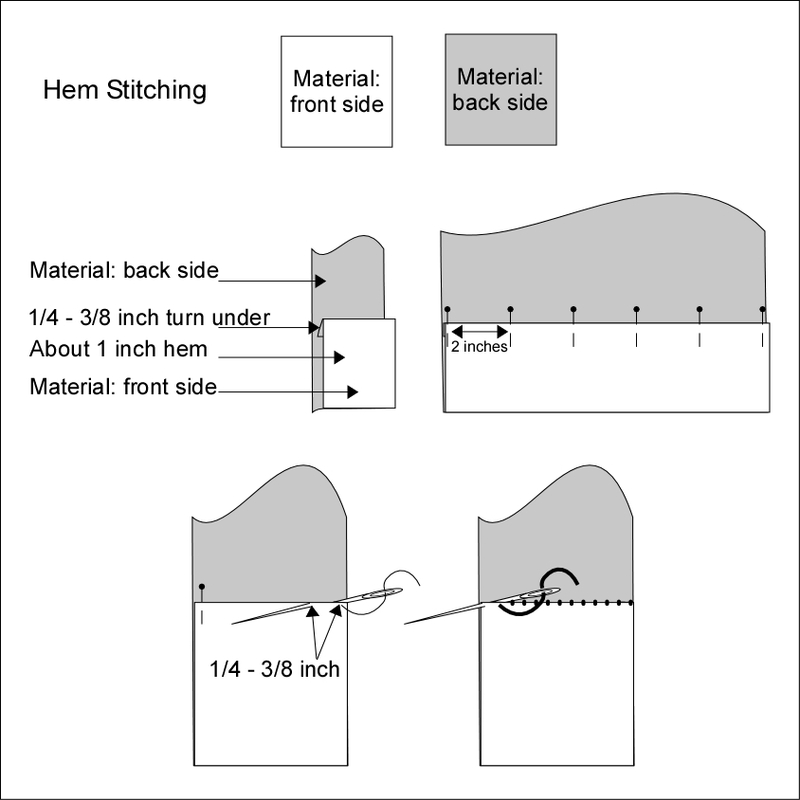 This 96 page book has many of the typical stitches with stitch diagrams and uses (i.e. 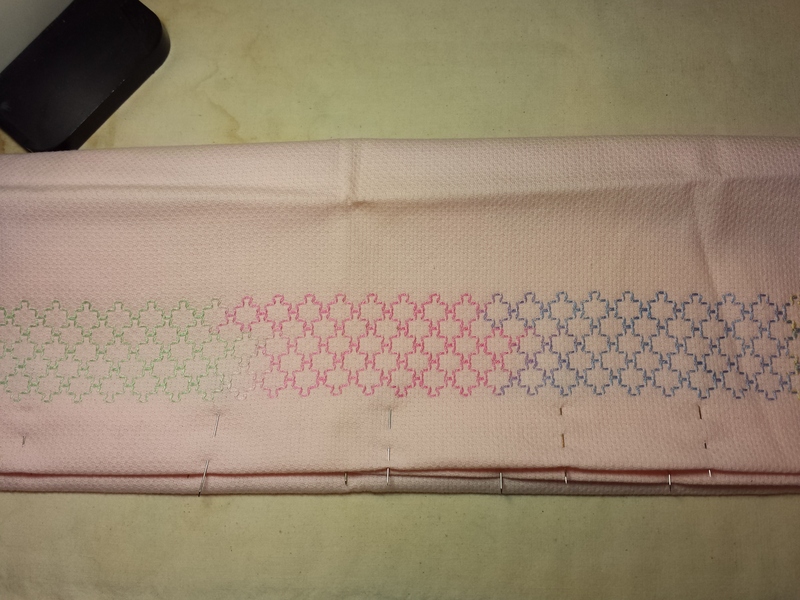 Gobelin, knitting stitch, diagonal mosaic…) but each of these stitches is shown stitched using different color threads to make a pattern within the stitch. There are 15 pages of bargello patterns, and a section on borders, stripes and corners. It’s a great little reference book for any needlepoint library. Note: I think I noticed in Amy Bunger’s January newsletter (http://www.amybunger.com/home.html), she has one for sale too. My final gift book is: Embroidered Portraits by Jan Messent. Jan writes great how to books that are full of good advice and inspiration. She shows faces in full, profile and three-quarter, some are stitched and some are painted. She layers the areas and gives hints on stitching. I had forgotten from my art class days that woman’s necks appear longer than men’s necks…it’s one of those things you know but the reminder is refreshing. I really liked this book and I am even contemplating making a portrait of my grandmother in needlepoint. When you have three good books to start the new year, the year is off to a good start! Thank you for stopping by and I hope you have time to stitch today! I went to clean out my ort box today and had to stop and look at all the orts. 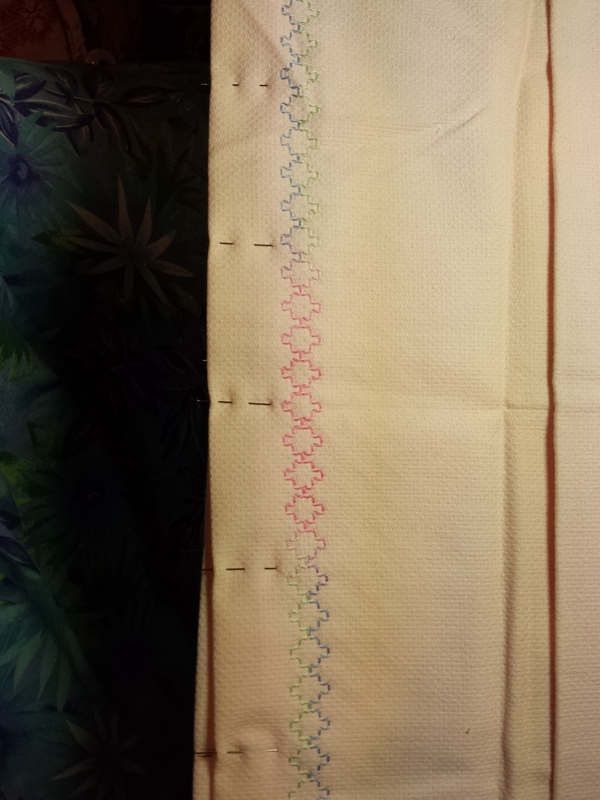 I have stitched… just not blogged about the stitching. Looking at these orts brought back a flood of memories I’ll share some with you as the year comes to an end. This has been a year of us and downs; but something good always comes from something unpleasant… I lost a very dear friend, Bill E. (aka: WEE) this summer to Colon Cancer. He put up a valiant fight and dealt with his disease in his own dignified style. I will miss WEE forever, he is a good man. We have been friends since my second son brought him home to eat chip chocolate cookies (and yes Bill, it is chip chocolate…not chocolate chip). I will never eat another chip chocolate cookie that I don’t think of you, Bill. One day I was baking cookies, kids were outside playing; Hugh, second son, was about four or five and had wandered down to the new neighbor’s front porch. They had a fish tank and Hugh was fascinated (a fascination that has lasted his whole life) and went in to look. I guess (I never asked) in the course of the conversation, it came up that I was home baking cookies. Anyway, Hugh came home and asked for a couple cookies for himself and his new friend, I gave them to him and off he went. He came back again and asked for more, I suggested that it might not be a good idea since it was almost dinner time and anyway, what did his new friend’s mother think about him having more cookies? Hugh left, only to return and tell me, “My friend doesn’t have a mother.” Opps, well what does his father think about him eating all these cookies? Off to new friend only to return with, “My friend doesn’t have a Dad either.” Now, Hugh has my full attention, he is playing with someone who has no adult supervision (not that Hugh was getting much adult supervision at the same time); maybe you should bring this new friend home to meet Mom. Off Hugh goes, and I, now ice tea in hand, go to front porch to watch. After a few minutes here comes Hugh holding the finger of this adult’s hand; I was sure Dad had come home and Hugh and his new friend were in serious trouble for being in the house with no adult supervision. But before I could apologize for my son’s behavior, Hugh introduced me to his new friend, Bill E. After I stopped being total embarrassed for my son bothering the new neighbor, I found out Bill was a hungry law student with a fish tank. I made a deal with Bill; I would feed him if he would to my legal work for life. Bill nicknamed Hugh, “Huge,” (another lifelong attachment) that proved to be prophetic…Hugh is 6 feet 4 inches, weighs a lot and is the largest of my children. And that day over ice tea and chip chocolate cookies a family friendship was born which has lasted a lifetime. But as the song says, “ For every time there is a season” and now the new season begins; Bill has a namesake, born this fall (fitting that it was the first day of fall too), Willow Emma (another WEE but more beautiful). I could hear him telling me how beautiful she is and that no other girl can compare, the new love of his life. She is his first grandchild, born to his oldest son Ron and his wife Nellie. And that leads me to one of my finished project(s); I crocheted a baby blanket for the new baby this summer and fall. I tired early this summer to teach Bill to crochet, but to no avail…he said I went too fast. But I did show him the yarn and pattern and told him I would complete it for the new baby. Then Bill’s wife, Jessica, asked me to help complete the blanket she knitted for baby Willow; so I crocheted the edging and lined her blanket…It’s that the coolest knitting pattern, I can’t knit but I love this blanket. If you would like to read more about Bill, Ron has written three wonderful articles about his dad. The last one was this Christmas Eve 2010.